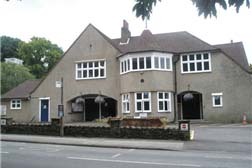 We meet at the Village Hall, Headley Road, Grayshott, Surrey, GU26 6TZ Meetings begin at 2.00 pm on Thursdays. The hall is equipped with a hearing aid induction loop. The hall telephone number is 01428 604787. Each lecture is accompanied by high quality digital images displayed on a full size (6metre) screen. A sound system reinforces the lecturer’s voice so that it can be heard in all parts of the hall, whilst a loop system makes sure that those people with suitable hearing aids also enjoy the lecture to the full. Prior to our lecture, while the audience are taking their seats, the screen is used to display announcements of all our forthcoming events such as – visits, social events and special interest days. Also,we show a small ‘taster’ of the visuals likely to be occurring in the following two lectures.